Mobile tubular steel frame with front locking castors. For drawings up to 60" long. Width is adjustable to accommodate different size drawings. Complete with 12 hangers and clamps. Expandeable Mobile tubular steel frame with front locking castors. For drawings up to 52" long. Steel frame attaches to wall and clamps are suspended by swivel hangers from one end. Complete with 12 clamps and swivel hangers. Steel frame attaches to wall, and Hangers are suspended by both ends. For use with vertical files. SWIVEL HANGERS Required to support end-held clamps. Packed in cartons of 12. Self-contained classic styling. Have integral cap and can be bolted together for stacking. Drawers have front metal plan depressor, and rear hood to keep documents flat and orderly. Dust covers optional. High Base designed to support one file only. Constructed from high grade furniture steel to exact tolerances. Finished in hardwearing baked enamel. Choice of 5 drawer or 10 drawer cabinets in 3 sizes. Choice of low base or high base. Colors: Gray, Beige, White or Black. 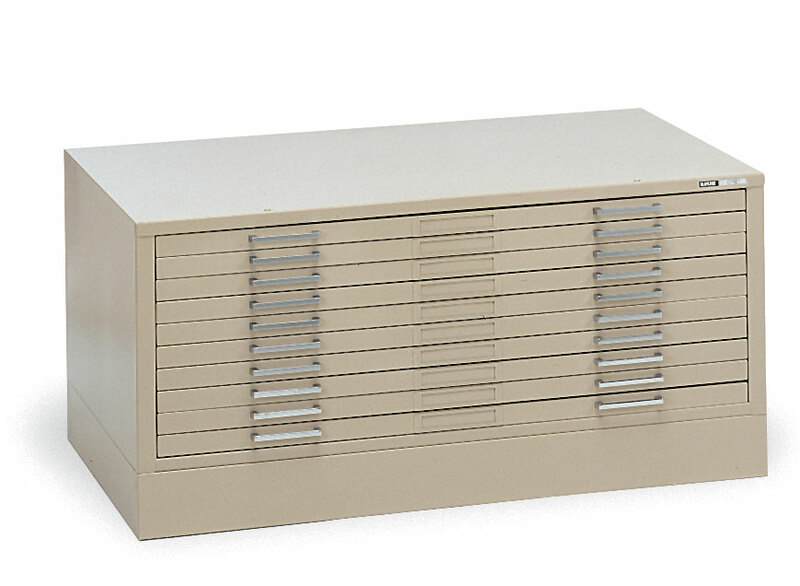 5 drawer or 10 drawer units can be combined into a single plan file system. Cap and base or legs can be added. Colour choice of Grey, Beige, White or Black. 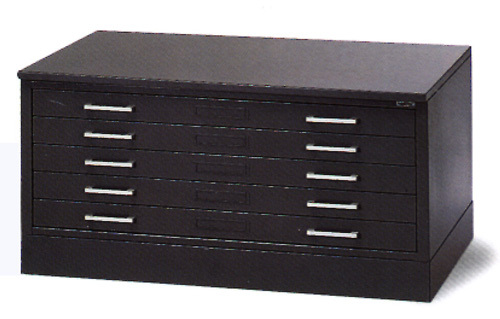 2 drawer or single deep drawer units are also available in 24" x 36" size only. Constructed from high grade furniture steel to exact tolerances, and finished in hardwearing baked enamel. 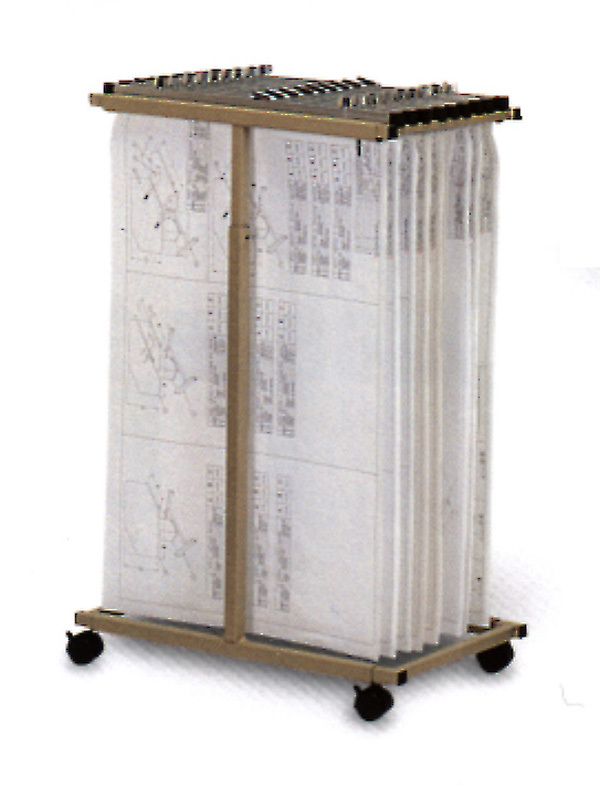 Self-contained Museum Files have integral Cap and can be bolted together for stacking. 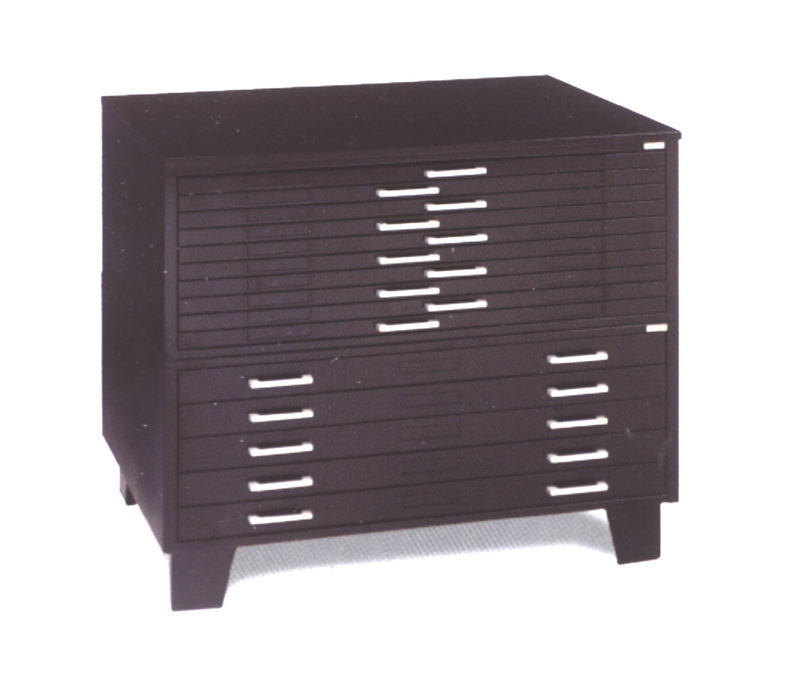 Drawers have front metal sheet depressor and rear hood to keep documents flat and orderly. Has fully enclosed drawer cabinet bottom. Drawer suspension uses greaseless nylon rimmed ball bearings to eliminate metal to metal contact and abrasion. Paint finish specially formulated to prevent outgassing. 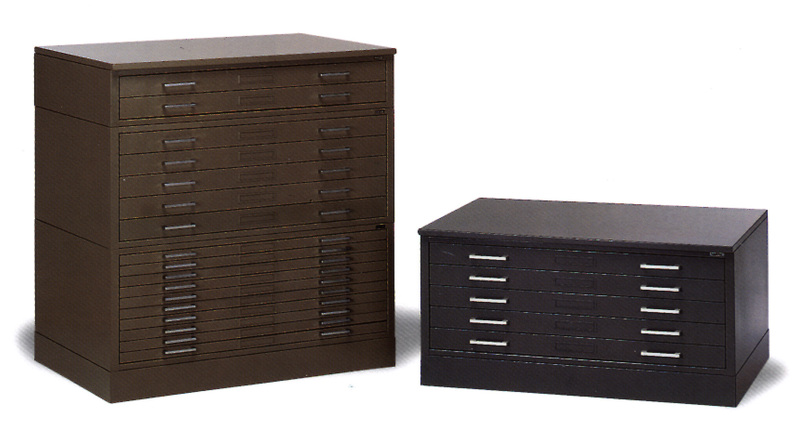 5 drawer or 10 drawer units can be combined into a single plan file system. 4" or 20" Base can be added, (20" Base supports only one file). Available in three sizes. Colour choice of Grey, Beige, White or Black. Constructed from high grade furniture steel to exact tolerances, and finished in hardwearing baked enamel. 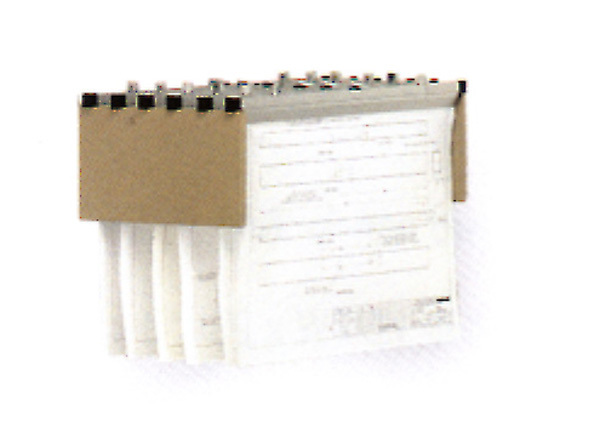 Interlocking steel plan files are designed for ease of stacking. Capacity 1000 sheets vellum per cabinet. Drawers have front metal sheet depressor and rear hood to kep documents flat and orderly. Separate Cap and Base. Available in three sizes. Colour choice of Grey, Beige, White or Black. 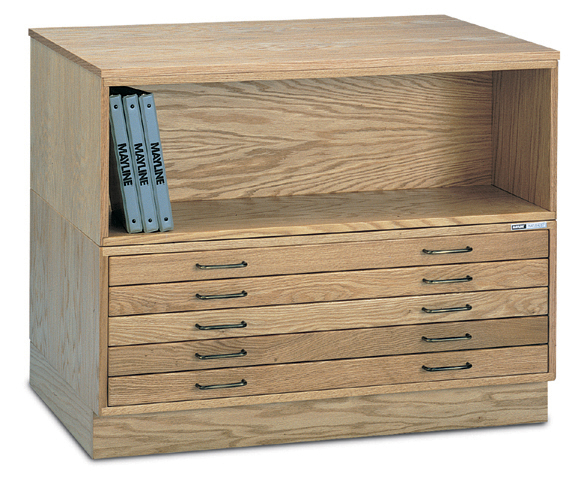 2 drawer or single deep drawer units are also available in 24" x 36" size only. Constructed from high grade furniture steel to exact tolerances, and finished in hardwearing baked enamel. Interlocking steel plan files by Hamilton are designed for ease of stacking. Capacity 1000 sheets vellum per cabinet. 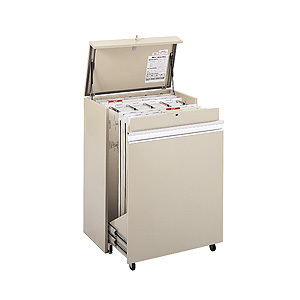 Drawers have front metal sheet depressor and rear hood to kep documents flat and orderly. Cap and base or legs can be added. Available in four sizes. Drawer fronts and case sides are finished in oak. 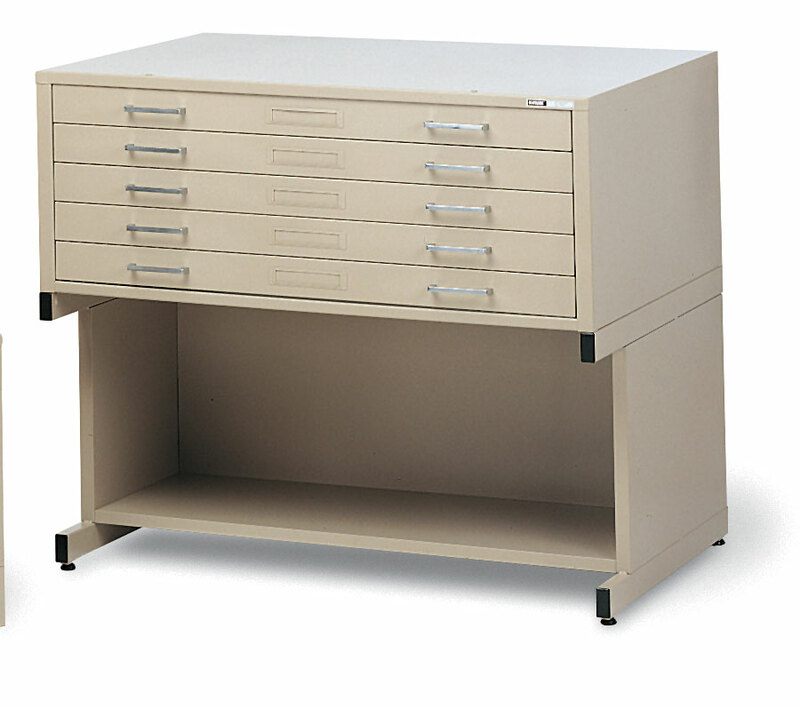 Five drawer and bookshelf units can be combined with cap and base to form complete designer plan file system. Store your valuable drawings safely and economically. Will hold up to 1000 drawings 36" x 48". No edge binding required, uses one suspension strip per drawing. removal of drawing with the maximum of convenience. No folding, rolling, tearing, creasing or damaging of valuable drawings. Also available with 4-pin configuration for extra support. Effortlessly retrieve one or multiple drawings without stooping or bending. Double Wall steel construction with insulating liner for extra strength and quit operation. Each document is attached to self-adhesive pre-punched carrier strips, and hung vertically from pins and posts. Equipped with locking mechanism for security. 80 strips 30", or 50 strips 48". VERTICAL PLANFILE Extra sturdy, extra storage, extra easy. Heavy duty steel enclosed cabinet. 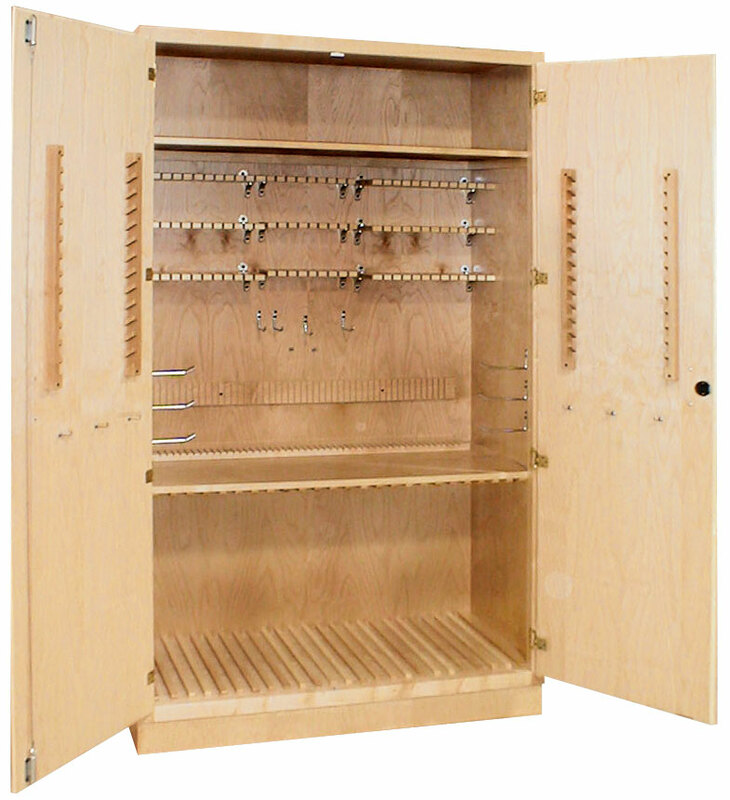 Holds 1200 drawings in 12 hanging clamps (sold separately). 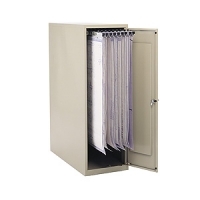 Provides dust free secure storage for valuable and confidential materials. Easily access stored documents with a suspended track that smoothly slides in and out on steel ball bearing rollers. The piano-hinged steel reinforced door can be left or right mounted, and comes with a key-locked handle. 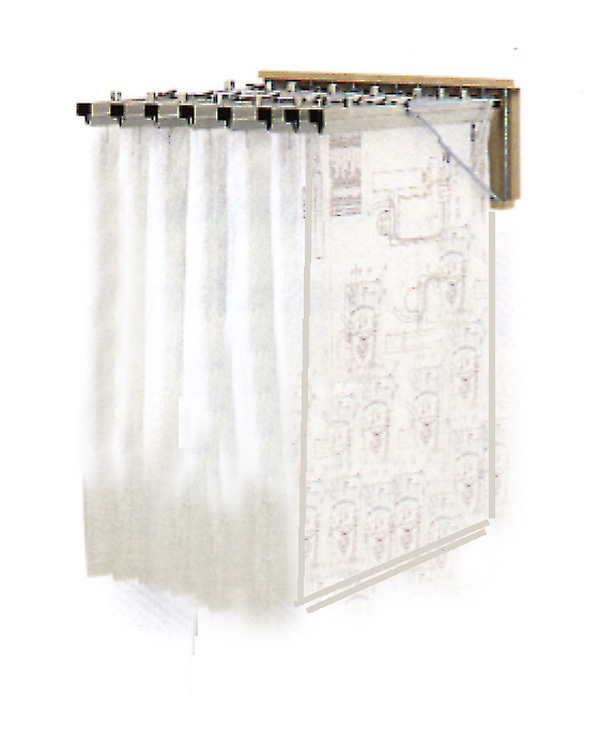 5040 for sheets up to 24" x 36"
5041 For sheets up to 36" x 48"
HANGING CLAMPS FOR ABOVE Aluminum clamps with black nylon wing knobs. Clear plastic label holder. Capacity 100 average drawings. Packed in cartons of 6. Sized to organize and store supplies for 24 or 36 students with ample storage space and easy visual checking by instructors. Premounted hooks and holders neatly sort and organize a variety of drafting supplies, including T-squares, scales, triangles protractors, pencils, erasers and much more. 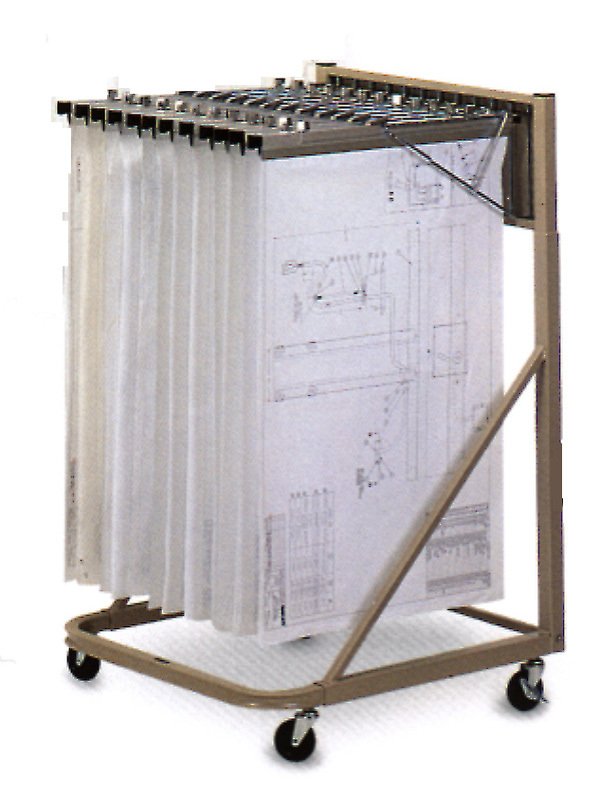 18" x 24" drawing boards can be stored vertically in slots along the bottom. Shelf space for books, paper and other drawing supplies plus room for further expansion on the back of each door. Master keyed locks included. Overall size is 48" or 60" wide x 22" deep x 84" high. Supplies sold separately.